​It was 1-1 against Southampton in a game Liverpool simply had to win to keep pace in the Premier League title race when Jurgen Klopp made a tactical change in the 59th minute. Both James Milner and Jordan Henderson were introduced to the fray at St Mary's, with the words of the charismatic German ringing between their ears to "make a difference" as the game hung in the balance. Come full time, the Reds had sealed a 3-1 win on the south coast, with ​Henderson supplying the assist for ​Mohamed Salah's solo stunner, before scoring a late third himself to wrap up the three points, and he hasn't looked back since. display in the previous game against ​Tottenham; a game he was substituted in as ​Liverpool secured a late 2-1 win. Although the result was the main thing, the fact the club captain came off in the midst of a title-defining game was sure to sting. Since then, Henderson has revealed details of ​a conversation between himself and Klopp regarding a positional change from in front of the back four to further forward. He said: "Me and the gaffer just had a conversation. I don't think the manager had thought about it too much until I mentioned it to him. It was something that he said he would think about. "For me as a captain and as a player at this football club, I always put the team first. I do whatever the manager tells me to do really. But when we had the conversation I felt that I could speak my mind. I want to contribute as much as I can to the team. I feel as though I can do that more in a further forward position." It wasn't due simply to a conversation however that has seen Henderson's switch into a more attacking position - he started the game against ​Southampton on the bench after all - but because he earned the right to with that display. Henderson's goal and assist against the Saints was the first time he's recorded both in a league game since December 2015 in a 2-2 draw against West Brom during Klopp's first months at the club. Since then however the German has opted to utilise the 28-year-old as a holding midfielder, relying on his quality on the ball, yet somewhat stifling arguably his greatest attribute; his running and energy. Following the game against Southampton, Henderson was rewarded by starting against FC Porto further forwards, with ​Fabinho deployed as Liverpool's holding midfielder, and it paid dividends. Henderson supplied a defence-splitting pass for ​Trent Alexander-Arnold, who teed up ​Roberto Firmino for the second in the 2-0 win, putting Liverpool on the verge of reaching the semi-finals of the ​Champions League for a second successive season. That quarter-final first-leg win against Porto was a rare instance of both Henderson and Fabinho starting together at Anfield, with the only other game being the 4-3 win against ​Crystal Palace in January. It's a prospect that we could see a lot more of between now and the end of the season. Throughout the campaign it's been either one or the other for that position, with the Brazilian gaining the upper hand as the season has progressed, but now there's a strong case to play both. The recent win against ​Chelsea, which saw Fabinho and Henderson start together, was billed as the final major hurdle for the Reds to overcome if they were serious about ending thier 29-year wait for a league title. With a large portion of the pre-match narrative centring around 'that slip' in 2014, one detail that faded into the background was the fact that Henderson was forced to miss that famous game due to suspension. He had been sent off in the latter stages of a 3-2 win over ​Manchester City two games prior for a naive challenge, with his presence greatly missed in the games that followed, as City went on to win the title. Five years on, Henderson was very-much involved this time around, as he produced a delicate chip to the far post for ​Sadio Mane to head home his 18th league goal of the season to open the scoring on 51 minutes. What's more, it would be a burst forward two minutes later, not having to curb his enthusiasm due to a holding midfield position, that gave Salah the space for a spectacular second in a 2-0 win, sending Liverpool back to the top of the ​Premier League, two points above City. Liverpool potentially have eight games remaining this season, which could result in the winning of both the Premier League and Champions League, meaning Henderson would become the first skipper to lift both for club in one season since another midfielder, Graeme Souness, in 1984. Henderson's time at Anfield has been one of peaks and troughs, although the winning of major silverware this season would see the club captain catapulted amongst greats of the club, with him playing a major factor in doing so. 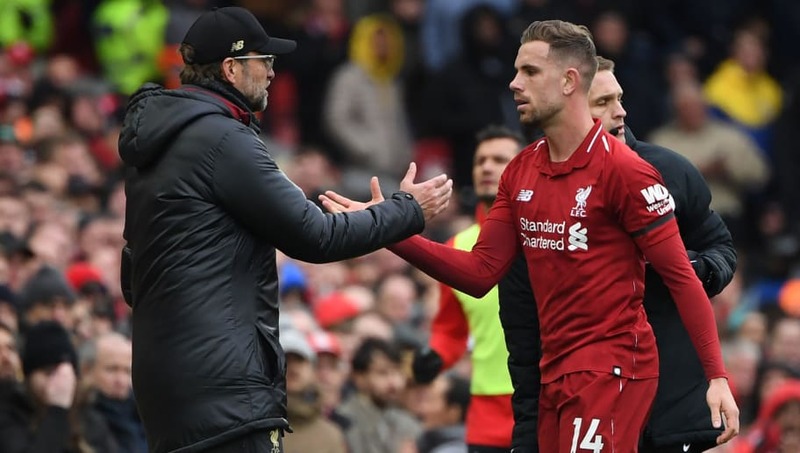 The positional change of Henderson, who is still on 28, has given Liverpool something extra in their run-in, which could be enough to end a 29-year wait for a league title and a European title in the short-term, and one of continual success in the future.